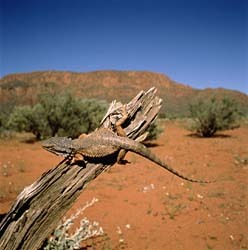 Western Bearded Dragon lives in north-western Australia, in a variety of habitats, including the Great Sandy Desert. There is some controversy about whether P. mitchelli is actually a species distinct from P. minor. Averaging only 5.5in snout-vent length, the Western Bearded Dragon is a very small species.